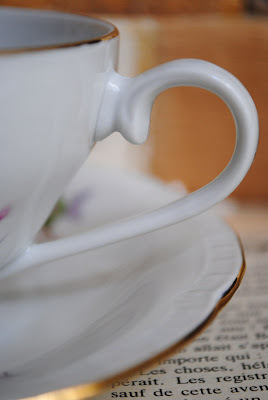 Artful Affirmations: Tea Cup Tuesday-New Cup and New Tea Pot! Oh my! That teacup is AWESOME!!!! oooops! and the TEAPOT! GORGEOUS! Lovely new cup! Your pot is a beauty. I do mean to join in on a Tuesday soon! Hi Terri! 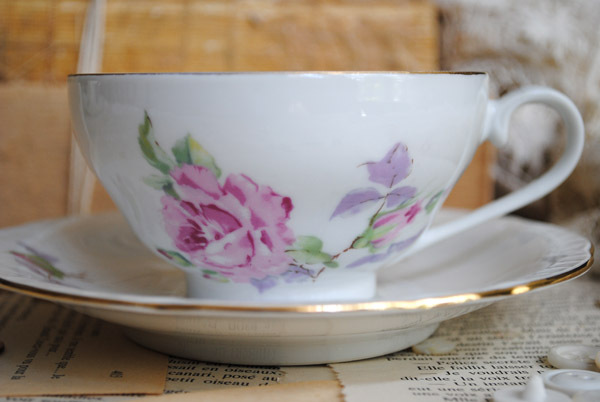 Your little thrifted teacup is so pretty. 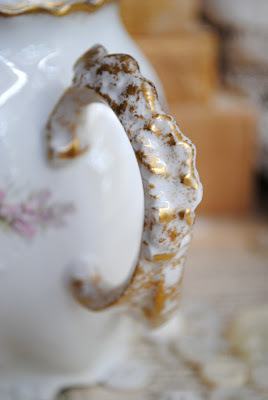 Don't you just get so excited to find a lovely teacup and then see such an amazing thrifty price tag! I always look like a kid in a candy store when I find one like that! And that little teapot is s lovely! What beautiful details on it. Thank you for hosting and have a wonderful week! Lovely teacup, Terri, but the teapot has me swooning! Love it! How lovely that you found it in England and were able to transport it back home. Thanks for sharing. 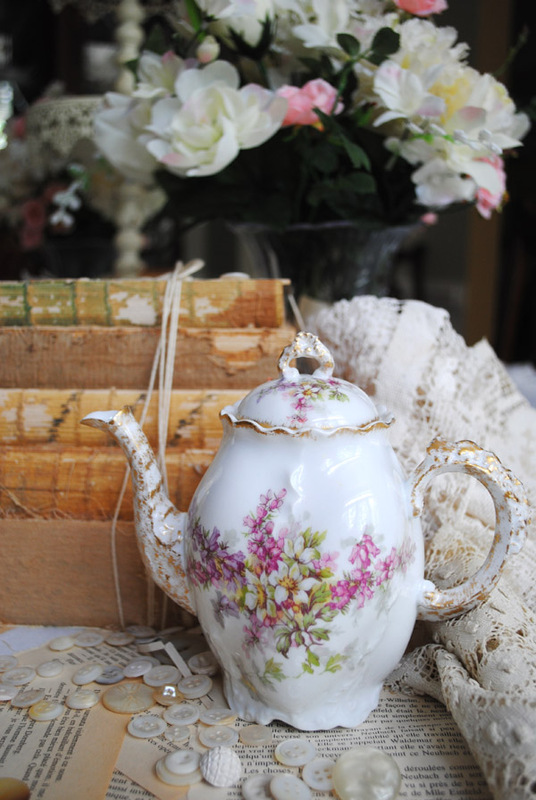 Your bargain teacup is beautiful and so is the Limoges teapot. That is quite an unusual and pretty handle. What a great reminder of your trip. ok, that is a DEAL if I have ever seen one...and that teapot, I think I almost feel over. LOVELY! 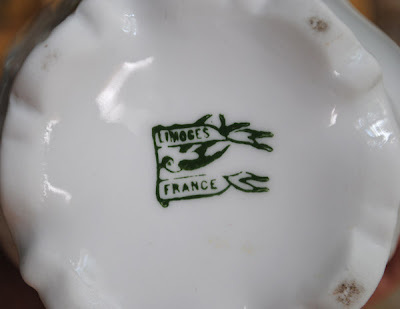 Fabulous find at the GW ~ I hope the ones in our area have wonderful treasures to be discovered ~ can't wait to see. Oh, Terri - don't you just love the Goodwill find! I found my little treasures today in a Goodwill shop - though I only mentioned it as a thrift story in my text. Your cup is sweet - but that pot is really a prize! Such an unusual size and shaping - and straight out of a English antique shop! I have a couple of young friends going to England for study. I'm sending them with a money card and instructions to get me something wonderful - but not sure how to direct them otherwise. They are young men, so tea things might not be up their alley. They are former players in my melodrama troupe finishing their college careers. Perhaps I should just let them loose in an English antique shop and trust God to lead them to just the treasure that might bless me - and subsequently a blog post - to perfection! Oh, I am in love with the teapot! 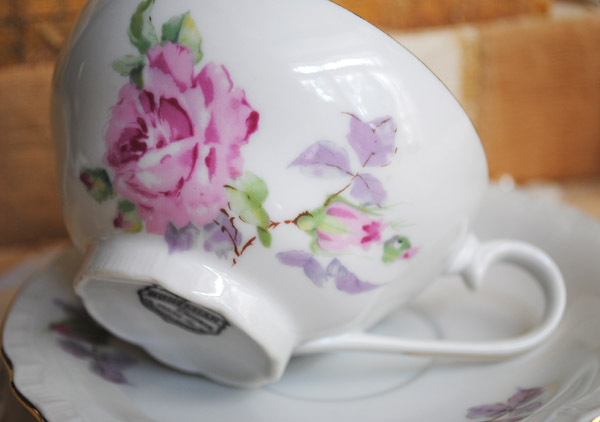 What a little beauty!~ I like the teacup too and such a deal. Thanks for having us. Hello there Terri! 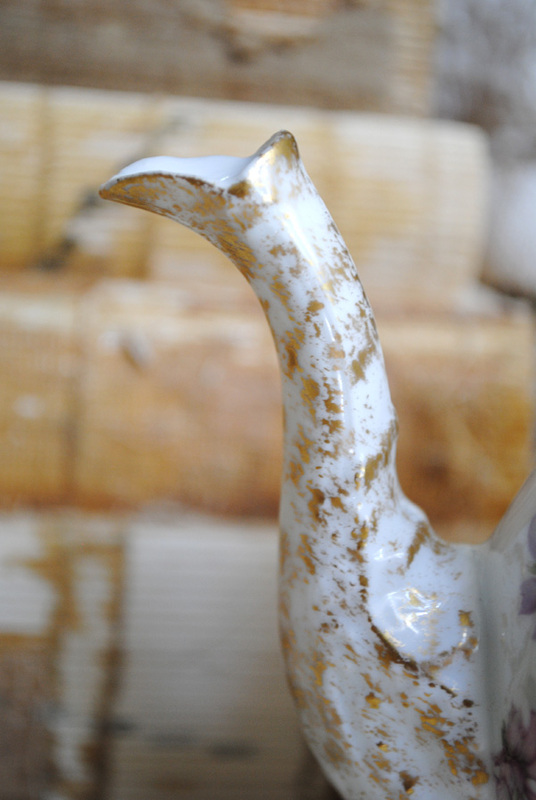 Love your finds this week, but really really love your new teapot. You hit the jackpot with that one. Happy Tuesday my friend! Two beautiful finds! I love the sweet tea cup. The pink and lavender are such a pretty combination. And the teapot, what a treasure. The shape, and floral pattern is beautiful, and I love the ruffly design. I love that tea pot and what a wonderful find on your tea cup! 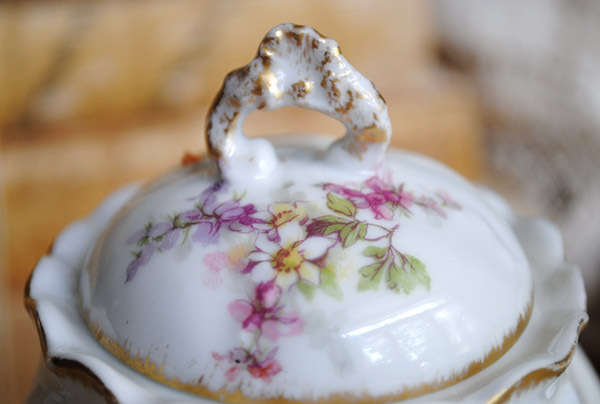 Terri, your tea cup is so sweet- BUT the pot is something very special, how gorgeously beautiful it is- wonderful find , and memory from your tour. the Czech tea cup is really pretty. I am not sure, but when you ask for Thun porcelain, have a look on www.thun.cz and use an automatic transplator. Maybe it is the maker, I don't know. Your china collection is always amazing. This are real juwels. Thank you for sharing. Your tea cup is lovely! The tea cup and teapot are totally Shabby Chic! Rachel Ashwell watch out! LOL! Your tea cup is lovely but that tea pot is to die for!! 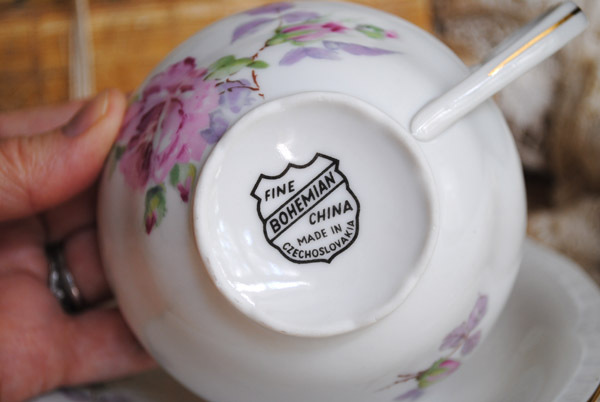 The teapot is just exquisite...what an elegant souvenir of your trip! charming teapot Terri! plus the added memories of its discovery! I loved your new cup! 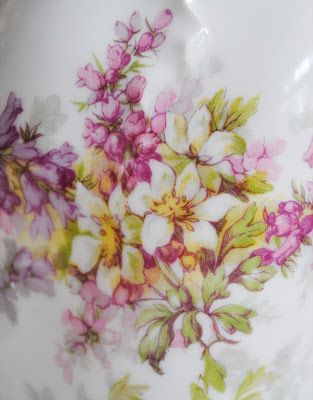 Bohemia has always produced very fine beautiful porcelain and this is a good sample of it. Hello Terri...I've been sooo busy, but I just had to stop by to say 'hello'. 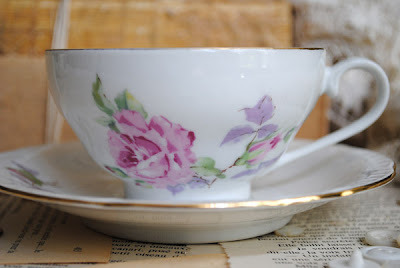 Your cup/saucer is very pretty - I love the colors and pattern. Your teapot is stunning! The shape and colors, the flower designs and gold accents are beautiful. I'm glad I stopped by, as always. What a steal on the cup and saucer. The teapot is so pretty....all the colors I adore. I'm sure it likes living in your home now. 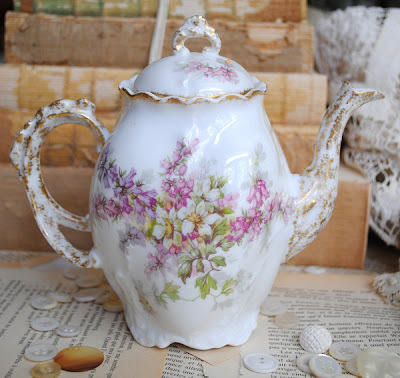 This Limoge teapot is really beautiful. Backstamps really can be very interesting. I hope you find the information you are searching for. HI Terri...oh my gosh..I am in LOVE with that tea pot! !oooh..you luckya gal..i want ont now too!